PROBLEM (WHY? ): From our data exploration of the UPSERVE dataset, we noticed that there were quite a few anomalies. Anomalies could cost a restaurant a significant amount of money if the restaurant is unable to meet demand. How could we help mitigate the damage from these anomalies?? WHERE UPSERVE COULD TAKE THIS: UPSERVE’s product currently gives restaurants percent changes in revenue. During our Datathon we did not have access to exact locations of restaurants. UPSERVE DOES have access to this and can combine that data with our anomaly detection model to give accuracy event listings and anomaly recommendations. 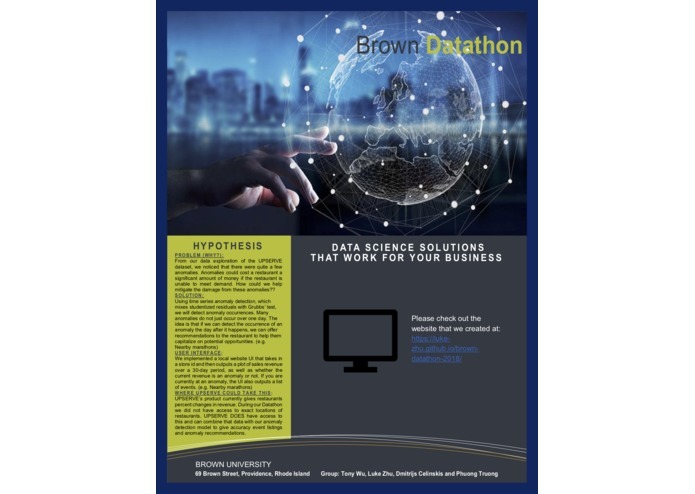 This was my first ever datathon and I participated as a competitor, data contributor (DiscoveryEngine dataset) and mentor. Learned a lot about work dynamics from the perspective of participants, external contributor and organizer. "Upserve Anomaly Detection" was my competitor track project, for which I implemented, evaluated and optimized several anomaly detection algorithms (3-sigma thresholding, moving average for suppression of slow background fluctuations, seasonal and seasonal hybrid extreme studentized deviate test).